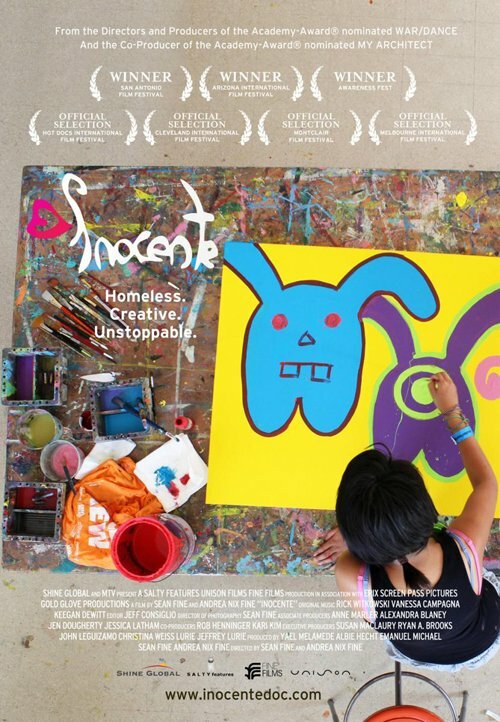 "Inocente" follows an undocumented, homeless teenager in San Diego as she finds herself and her purpose with help from a nonprofit arts educator. (THOUSAND OAKS, Calif. – Sept. 17, 2014) California Lutheran University’s 2014-2015 Reel Justice Film Series will kick off with an Academy Award-winning documentary on a young artist. “Inocente” will be shown at 7 p.m. Tuesday, Oct. 7, in Lundring Events Center on the Thousand Oaks campus. A panel discussion will follow. The 2012 film, which received the Oscar for Best Documentary Short Subject, follows an undocumented, homeless teenager in San Diego as she finds herself and her purpose with help from a nonprofit arts educator. Inocente’s colorful paintings slowly reveal her family history. Her father was deported for domestic abuse. Her alcoholic and overwhelmed mother once took her by the hand to jump off a bridge together. Homeless for the last nine years, Inocente has been shuffling through overcrowded shelters with the threat of deportation hanging over her. The film was a winner at the San Antonio Film Festival, Arizona International Film Festival, Awareness Fest, EBS International Documentary Festival of South Korea, Heartland Film Festival, Flagstaff Mountain Film Festival, and Women + Film VOICES Festival. The inspiring film speaks to the importance of arts education and provides a snapshot of the current face of homelessness. There are 1.5 million homeless children in the United States today, and undocumented immigrants make up the largest and fastest-growing segment, according to the filmmakers. The panel discussion will feature John Puglisi, superintendent of the Rio School District; Nema Pierce, principal of Mariposa School of Global Education in Agoura Hills; and Heidi M. Coronado, assistant professor of counseling in Cal Lutheran’s Graduate School of Education. Representatives of Cal Lutheran’s student body and alumni who are involved in art will join them. The Reel Justice Film Series will continue with “Dallas Buyers Club” on Dec. 2. Cal Lutheran’s Center for Equality and Justice (CEJ) launched the series in 2007 to highlight films that inspire people to address challenging issues of our time. Cal Lutheran’s CEJ, Graduate School of Education, Art Department and Pearson Library are sponsoring the free event. For more information, contact Maureen Lorimer at mlorimer@callutheran.edu or the CEJ at 805-493-3694 or cej@callutheran.edu.